Kendall Bernell Hunter (born September 16, 1988) is a former American football running back. He played college football for Oklahoma State University, and earned consensus All-American honors. The San Francisco 49ers selected him in the fourth round of the 2011 NFL Draft. Hunter was born in Tyler, Texas. He attended John Tyler High School in Tyler, where he played football and ran track. In football, he rushed for 1,200 yards and 14 touchdowns as a senior. Considered a three-star recruit by Rivals.com, Hunter was listed as the No. 40 running back prospect in the nation. Hunter suffered a knee injury in high school that limited his potential suitors. Hunter was a first-team all-district selection following his junior season during which he rushed for 1,056 yards and twelve touchdowns. He also competed in track & field. He was timed at 11.3 seconds in the 100 meter dash as a senior. He was also a member of the 4 × 100 m relay (41.58 s). "2007 Oklahoma St. Football Commitment List". Rivals.com. Retrieved December 14, 2014. "2007 Oklahoma State College Football Recruiting Commits". Scout.com. Retrieved December 14, 2014. "Oklahoma State Cowboys 2007 Player Commits". ESPN.com. Retrieved December 14, 2014. "Scout.com Team Recruiting Rankings". Scout.com. Retrieved December 14, 2014. "2007 Team Ranking". Rivals.com. Retrieved December 14, 2014. "Oklahoma State 2007 Football Commits". 247sports.com. Retrieved December 14, 2014. 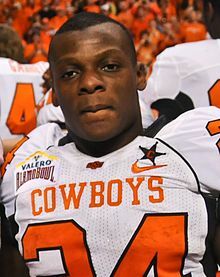 While attending Oklahoma State University, Hunter played for coach Mike Gundy's Oklahoma State Cowboys football team from 2007 to 2010. He was the nation's seventh leading rusher with 119.6 yards per game, including nine 100-yard rushing games, in 2008. He led the Big 12 Conference in rushing by more than 30 yards per game. He was named a first-team All-American after his sophomore season in 2008, and was recognized as a consensus first-team All-American as a senior in 2010. As a senior, he was also a finalist for the Doak Walker award which was won by LaMichael James, his teammate with San Francisco until James's release in 2014. Measurements taken at the 2011 NFL Scouting Combine. Hunter runs the ball in 2012 against the Green Bay Packers. Hunter was selected by the San Francisco 49ers in the fourth round (115th overall) in the 2011 NFL Draft. Hunter received his first start of his NFL career in week 4 of the 2011 season against the Philadelphia Eagles. He rushed for 473 yards (with an average yard per carry of 4.2) and scored 2 touchdowns during the regular season in a backup role to starting running back Frank Gore. Late in the 2012 season Hunter was put on injured reserve with a torn Achilles. Over the summer of 2013, Hunter reportedly rehabilitated at Cosumnes River College with physical therapist Weinshilboum according to a June 18 article in the Sacramento Bee. Hunter spent time performing parcour across the Cosumnes campus, Bee writer Yolanda Marie wrote. Hunter was activated off the physically unable to perform list on August 10, 2013, nearly 8 1/2 months after he partially tore his left Achilles. On July 26, 2014, Hunter was carted off the field due to a knee injury. Later an MRI revealed that he tore his ACL. The 49ers waived/injured him on August 5. After clearing waivers, he was placed on the 49ers' injured reserve list. On December 16, 2015, Hunter signed with the New Orleans Saints after starting running back Mark Ingram was placed on injured reserve. On January 1, 2016, Hunter was placed on injured reserve. On March 1, 2017, Hunter signed with the Toronto Argonauts of the Canadian Football League (CFL). On June 2, 2017, Hunter announced his retirement from professional football. ^ "Rivals.com running backs 2007". Rivals.com. January 23, 2007. ^ "Scout.com: Kendall Hunter Profile". Recruiting.scout.com. Retrieved September 30, 2012. ^ "Oklahoma State's Kendall Hunter named finalist for Doak Walker Award | Dallas-Fort Worth College Sports News – Sports News for Dallas, Texas – SportsDayDFW". Dallasnews.com. November 22, 2010. Retrieved September 30, 2012. ^ "Combine Player Profiles: Kendall Hunter". NFL. Retrieved December 14, 2014. ^ "Kendall Hunter". NFLDraftScout.com. Retrieved December 14, 2014. ^ "San Francisco 49ers: Kendall Hunter activated off physically unable to perform list". August 10, 2013. ^ Patra, Kevin (July 26, 2014). "San Francisco 49ers' Kendall Hunter suffers torn ACL". NFL.com. Retrieved July 26, 2014. ^ Patra, Kevin (August 4, 2014). "San Francisco 49ers waived/injured RB Kendall Hunter". NFL.com. Retrieved August 5, 2014. ^ Corkran, Steve (August 5, 2014). "49ers' Kendall Hunter placed on injured reserve after clearing waivers". San Jose Mercury News. ^ "Saints sign RB Kendall Hunter, promote FB Toben Opurum". ESPN.com. Retrieved December 17, 2015. ^ "Saints' Kendall Hunter: Placed on IR - CBSSports.com". CBSSports.com. Retrieved January 3, 2016. ^ "Argos sign former 49ers RB Kendall Hunter". CFL.ca. March 2, 2017. Retrieved March 2, 2017. Wikimedia Commons has media related to Kendall Hunter.